It didn’t take long for Spikeball sets to make their way onto beaches across the world, and now players are finding ways to play it in the winter. For those unfamiliar with the game, Spikeball is essentially like playing volleyball on a trampoline. 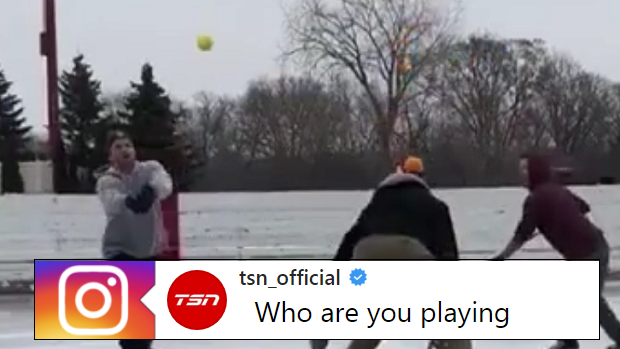 Games are typically played on softer surfaces to allow players to dive but that might be an issue for these dudes, who decided to take their set onto the ODR. Instead of their hands, these dudes decided to use their sticks and it made for quite an intense rally. This one looks like an absolute MUST for the winter. Barring it’s not -50 outside you should probably grab some buds and head to an ODR to play ASAP! Okay, so this isn’t exactly the first hockey game we’ve seen with a bit of a twist. Rather than hitting the ice, some athletes actually play hockey under water. Just crazy!!!! Alright readers, we’re challenging you all now to come up with your own hockey related game for the winter. We want more!